For the first three lines you think you’re looking at blank verse; but that’s just Auden settling his spikes into the running blocks. After that, we’re off. Any ha’penny free-verse merchant can spill out a couple of stanzas with no apparent structure of line length: but it takes a poet like Auden – or perhaps Eliot – to remind you that when structure is relaxed, talent must supply the deficiency: and for sheer poetic talent you have to look a long way to find someone to even touch Wystan Hugh Auden. Can you spot the rhyming pattern? Go on – have a go. It is there. There’s another Auden touch: he didn’t need anyone else’s verse forms: he invented his own. This isn’t just a superbly conversational piece of verse (and what a conversation! ); it’s a stunning set of insights. Suffering doesn’t take place in exalted settings; the rest of the world is often indifferent to it, and busy people will be too busy to mark the occasion of the sufferings of others. A poem like this feels effortless: and that’s the first big hint, in literature, that someone was sweating cerebrospinal fluid over it. The suggestion here is that great artist sees further into both the extraordinary and the commonplace in life: and that’s a view of artistic insight that we want to endorse. Auden, of course, was so good that he could reveal what made great art in a piece of great art. Not a bad trick. If Auden’s scrotum was anything like his poetry, it must have looked like Helen of Troy. This entry was posted in Poetry and tagged Art, Breughel, David Hockney, Helen of Troy, Icarus, Poetics, Poetry, Scrotum, Suffering, W H Auden. Bookmark the permalink. Always love waking up on a Monday morning (here) to a nice poem and an observant analysis. And this time you were thoughtful enough to include a picture. Maybe I won’t need that second cup of coffee. 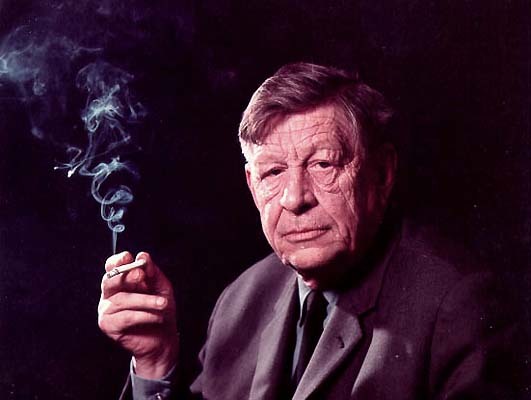 Seriously, I like this — and I like that you mention Auden. He’s one of those poets I need to sit down and read comprehensively — though that would take far more time than I have available.